Training is a process by which an athlete is prepared for the highest level of performance possible. Individualization is one of the main requirements of contemporary training. Individualization requires that the coach consider the athlete’s abilities, potential, and learning characteristics and the demands of the athlete’s sport, regardless of the performance level. After long periods of training, hard work, and stressful competitions in which both physiological and psychological fatigue can accumulate, a transition period should be used to link annual training plans or preparation for another major competition, as in the case of the bi-cycle, tri-cycle, and multicycle annual training plan. 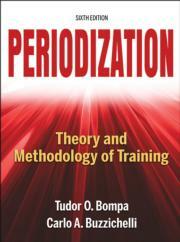 Tudor O. Bompa, the pioneer of periodization training, and Carlo A. Buzzichelli, one of the world’s foremost experts on training methods, use scientific support and their expertise to teach you how to maximize training gains with periodization.